Swimming offers a whole body workout, exercising almost every muscle we have, it’s also great for cardiovascular fitness, building endurance, lung capacity and muscular strength. Follow Sportsister’s downloadable training plan to improve your swimming. Swimming is a non-impact activity – when you swim the water acts a cushion around your body – so it’s good for everyone, even those with injuries. 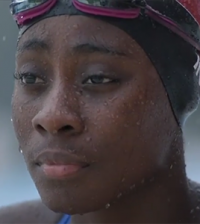 Most of us would like to be better swimmers and it’s easier to improve than you might think. By making a few simple adjustments to your stroke and stepping your training up a notch you could be giving Rebecca Adlington a run for her money before you know it! To be a better swimmer there are two key aspects which you need to focus on – technique and progressive training. Good technique is essential in the water and if your technique isn’t great, you’re probably working a lot harder than is necessary to get from A to B. Improving your technique will have a significant effect on your performance in the pool, you will learn to travel further in each movement and use less energy to complete each stroke. This helps to develop a long stroke so you travel the furthest distance with the minimum of effort. With one arm stationary and extended forward, holding onto a kickboard, perform a stroke with the other arm. When the working arm recovers and catches up with the stationary arm, switch hands on the kickboard and repeat. High elbow swimming allows you to use your entire forearm and hand as a paddle rather than just your hand. As your arm moves forward after the pull, trail your fingers through the surface of the water. Focus on keeping your elbows pointed up. Your fingertips should never leave the water. The 10 and 10 drill develops a good body roll essential for the correct breathing position. Extend one arm and roll onto your side as if you were taking a breath. Kick ten times in this position and then take a stroke so that your body rolls onto the other side and your arms switch places. One arm drill lets you focus on building strength in both arms. Keeping one arm by your side, perform your usual stroke with the other six times and then switch arms. 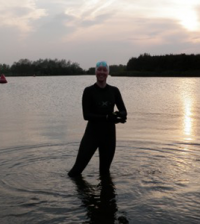 You probably wouldn’t dream of running the same route and at the same speed week after week, yet for many of us, a swim means the same amount of lengths at the same steady pace. Whilst this approach is good for overall fitness, you’re unlikely to see any real improvements in your performance in the pool. This six week training plan is designed for improver swimmers who are ready to take their training to the next level. 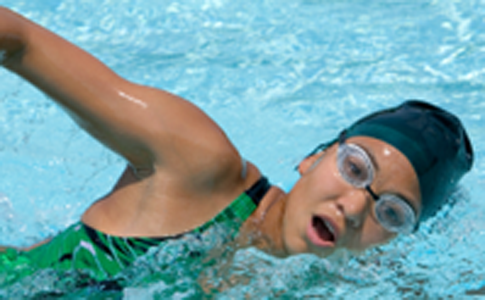 Before you begin your swim, focus on stretching the shoulders, upper back and triceps, and also the quads and glutes. Aim to complete each session three times a week. Click here – how-to-be-a-better-swimmer – to download your training plan in an easy to print off and use format.